“ What is “community” and why do we yearn for it? If we have lost our sense of community, how do we get it back? What is the spiritual need that draws us all to community? The series is a comprehensive look at community and community building. Mental and spiritual connections to community as well as the actual physical construction of housing alternatives are addressed through exploring the nature of present day living situations and those which may be anticipated in the future. These days it seems more and more people are seeking a sense of belonging, a home. Often the traditional ties of home and family have been severed by various circumstances and this can lead to feelings of alienation, depression and disconnection. There seems to be a refugee mentality rampant as large numbers of people migrate from one place to another in ever increasing waves and with ever increasing frequency. Unfortunately, it does not look as if the overpopulation of the planet is going to subside. People have decided that they want more people in the place of other things. So a new paradigm is forming, possibly of necessity, a paradigm which will attempt to reinvent the meaning of human relationships and dynamics through, what has been in many cases, grassroots endeavor, often in spite of rather than with the help of governmental assistance. Identifying with a community, being important within a community setting, is a basic human need. The study is one of a number of articles on the health impact of sprawling development published in late August in special issues of the American Journal of Health Promotion and the American Journal of Public Health. The report “The Health Effects of Sprawl,” is available at www.smartgrowthamerica.org. Smart Growth America is a coalition of nearly 100 advocacy organizations that have a stake in how metropolitan expansion affects our environment, quality of life and economic sustainability. The Surface Transportation Policy Project is a diverse, nationwide coalition working to ensure safer communities and smarter transportation choices that enhance the economy, improve public health, promote social equity, and protect the environment. The Board of Directors of Friends of Skagit County voted to endorse the Skagit County Charter Government initiative. Election day is November 4. Don’t forget to VOTE. We want to acknowledge the following foundations for their generous support in 2003. Their endorsement of our work is of great benefit to all of us. We would also like to thank NPower-Seattle and OneNorthwest for superlative technology support. Part of the work that Friends of Skagit County does is promoting issues that improve the livability of our communities. Our members come from all across the county and beyond and we are concerned about quality of life in all parts of the county, including issues and policies that make our roads and trails safer and more accessible for bikers, hikers, joggers and walkers. We have had a long-standing concern about the lack of adequate non-motorized transportation (NMT) planning in Skagit County. In 1997 the Western Washington Growth Management Hearings Board agreed with us that Skagit County needs to complete a NMT Plan, and the County has been under orders to develop a NMT plan since then. The County and their consultants published a very good plan in 2001/02. We dropped the ball by not speaking out in support of it at the 2002 hearing. We felt it was a plan we would support and that it did not need defending. That was our misconception because you ordered the Planning staff to substantially rework that plan. We believe that the bulk of the most useful material from the 2001 Plan has been removed. At present pedestrians and bicyclists are forced into harms way on many of our city and county roads. That is unacceptable and must change. We wholeheartedly disagree with the assumption that “Skagit County does not need more then two or three county roads to serve as non-motorized transportation routes” (Planning Commission Recorded Motion, August 14, 2002). We believe the County NMT Plan should operate under the assumption that the ENTIRE road network is of value to non-motorized users. We also feel that the County trail system should be expanded and improved to encourage all county residents to get more healthy physical exercise. The existing trails are very popular, and we believe that there will be increased demand for more trails as our population continues to grow. Survey data collected in Skagit County indicate that more than 70% of Skagit County adults ride a bike at least occasionally (see p. 26 of the 2002 NMT Plan) and that there is a high demand for pedestrian facilities, both recreational and for transportation (see p. 60 – 62 of the 2002 NMT Plan). non-motorized users of our public roads and streets in this current plan? This document provides interesting background information, but it is not a plan. And it is certainly not a NMT Plan that we will be able to support. The draft 2002 Plan identified concerns that pedestrians and cyclists raised during the public involvement process that went into preparation of that document (p. 33). Issues of HIGH concern to both pedestrians and cyclists included: Lack of facilities; Roads unfriendly; Accidents/Hazards/Safety; Barriers / Physical constraints; and Lack of Funding. A good NMT Plan should address these issues and pose some solutions. This document does neither. Mandates in the Growth Management Act include adoption of 6-year transportation plans that should specifically reference how Skagit County will expend money, including funds for non-motorized transportation (RCW 36.81.121 and Chapter 47.30 RCW). We do not believe that this current plan address this issue adequately. In summary….we believe (this) is an inadequate substitute for a true Non-motorized Transportation Plan, and we assume that the Hearings Board will agree with us…We recommend the Planning Commission revisit the 2002 NMT Plan and reconsider adopting that document. Skagit County is being paved at an alarming rate. Friends of Skagit County is so concerned about this that we have been involved in court proceedings to try to do something about it. 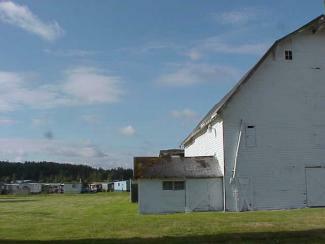 Skagit valley farmland in particular is under significant development pressure. Local data indicate that between 1995 and 2002, two hundred and thirty-eight (238) permits were issued on 2907 acres of agricultural zoned land (data analysis provided by CommEn Space). The average lot size on this land was approximately 10 acres, mostly in areas where the current zoning required 40 or 80 acre minimums. This pavement rate is unacceptable to us. With less than 100,000 acres of farmland remaining we need to ensure that enough land stays in large parcels in order to retain a critical mass to support our farming infrastructure. In a memo dated April 4, 2003 to the Planning Department, the Skagit County “Farmland Legacy Program” stated that there were at least 5900 substandard parcels in the agricultural zone alone. The memo also states that there are 3967 parcels that are 5-acres or smaller, and there are 1269 buildable lots in the Ag-NRL between 10 and 30 acres. Without stricter regulation, the Valley will continue to be subdivided into low density sprawl. Bad policies and ordinances that allow this to happen in the ag lands could encourage low-density sprawl on the islands and in the forestlands as well. For several years now, FOSC has been involved in a Hearings Board appeal to encourage the County to address how to aggregate these substandard lots, not how to legalize them. Two different, and in our opinion unacceptable, draft ordinances went to public hearing in April 2003. FOSC objected to both drafts, neither was adopted, and the County is supposed to be working on new ordinance language. In September the Western Washington Growth Management Hearings Board recently granted the County an additional 180 days to come into compliance on the lot aggregation issue. We will continue to participate in negotiations. Some of our concerns about the draft ordinance language that was put forward last spring were: 1) it excluded substandard lots created after March 1, 1965; 2) there were too many exceptions that would allow development on substandard lots created before March 1, 1965; 3) the provisions for “Certificate of Eligibility” would have allowed owners of substandard lots to vest development rights forever, which would prohibit future efforts to address the issue of substandard lots; 4) disclosure requirements which serve to protect innocent purchasers should be a required part of the real-estate transactions associated with sale of any substandard lots; 5) exceptions which would allow a second residence to be built on a substandard lot are not appropriate. The existing ordinance is inadequate. And the pressure to legalize lots not allowed under the existing inadequate ordinance is growing. A good lot aggregation ordinance is a very important tool for eliminating some of the sprawl pressure in the rural areas in Skagit County. We think our County should make substantial efforts to phase out substandard lots, and should not continue to try to find ways to legitimize them. Our original appeal to the Hearings Board received a favorable ruling on this issue, as did a pre-trial decision at the Superior Court level. We believe we will prevail on this issue. And we want to see it through to a good outcome. Note: 28% of the permitted development went into the Ag lands (total acreage). 41% went into rural reserve lands. Only 16% combined went into the Rural Villages and Urban Growth Areas. Data analysis completed by CommEn Space. We believe a good lot aggregation ordinance will discourage sprawl into Skagit County’s prime farmlands. We have awesome news! Thanks to some very hard work done by our board members, Friends of Skagit County is just $500 away from earning a sizeable challenge grant from the Bullitt Foundation! The Bullitt Foundation will match 1:1 all qualifying donations, up to $5,000. This means that FOSC could receive as much as $10,000!!! • Increased contributions (over the previous year) from existing members. • Contributions from NEW major donors (major donors are individuals who give more than $250 at one time). The Bullitt Foundation supports the work of nonprofit organizations that protect, restore, and maintain the natural physical environment of the Pacific Northwest for present and future generations. FOSC will use the proceeds of the grant to further develop and disseminate our SmartGrowth program, which informs and educates communities about the benefits and importance of managing growth. Do you have some time to help us with any of the following tasks? If so, we’d love to hear from you. Please call the office to talk about these volunteer opportunities. 419-0988. · That we still have several active Hearings Board cases on issues including Non-motorized Transportation, Rural Sign Ordinance, etc. Nov. 3 – Ways We Live program at Burlington Library’s meeting room. 6 – 7:30. Nov. 10 -- Ways We Live program at Burlington Library’s meeting room. 6 – 7:30. Nov. 17 -- Ways We Live program at Burlington Library’s meeting room. 6 – 7:30. Nov. 22 – FOSC Annual Meeting. 3 – 5 p.m. Shannon Point Marine Center (Anacortes). Nov. 24 -- Ways We Live program at Burlington Library’s meeting room. 6 – 7:30. Jan. 23 – Storming the Sound – A regional gathering of environmental educators. 9 a.m. – 4 p.m. Maple Hall. LaConner. FOSC is a co-sponsor. Jan. 26 – Ways We Live program at the Skagit Valley Food Co-op meeting room. 6:30 – 8:30. Jan. 21 – FOSC Board Meeting. 6:30 at the office. Feb. 7 & 8 – Upper Skagit Bald Eagle Festival. Volunteers are needed for the FOSC booth. The following comments are excerpted from a comment letter that FOSC submitted to the City of Mount Vernon on ALFCO Inc’s proposal for a Comp Plan amendment and rezone. The ALFCO property is surrounded by resource land and was included into the UGA against the wishes of FOSC years ago. To accommodate those concerns (and a hearings board directive), Mount Vernon created an ordinance for transferable development rights (TDRs), that allows ALFCO to sell development rights of this land. The idea behind the ordinance is that agricultural land in UGAs is inappropriate and the city needed to devise a way to meet population goals by absorbing into other areas in the city the development potential that is lost when urban acreage is left in agriculture. We understand that the City’s TDR ordinance relies heavily on the planning director to decide how to implement it. It has never been used and has been an issue of concern to the mayor, council, and planning commission. We understand that the Planning Director has convened a committee for the city whose task is to develop policies and procedures on wetland banking and TDRs. The point of the TDR ordinance was to keep this property working agricultural land and absorb the density elsewhere in the city. By rezoning the property, we would lose agricultural land and, at the same time, throw the TDR issue into a quandary. This is the wrong time to be rezoning this property for that reason alone. The Washington Supreme Court has held that GMA creates an “affirmative duty” on local governments to designate and conserve agricultural lands to assure the maintenance and enhancement of the agricultural resource industry (King County v. Central Puget Sound Growth Management Hearings Board, 142 Wn. 2d 543, 554 (2000); Redmond v. Central Puget Sound Growth Management Hearings Board, 136 Wash. 2d 38 (1998)). Resource lands such as farmlands should be excluded from substantial residential development. November 22, from 3 – 5 p.m.
Our meeting will take place in the SPMC Commons. There is limited parking at the Commons, and a lot more parking available ¼ mile down the drive near the Sundquist Lab. Directions to SPMC: Follow Highway 20 through Anacortes; Proceed straight through light onto Sunset Rd. when Hwy 20 turns down the hill toward the Ferry terminal. Shannon Point Road will be on your right in ~ ¾ mile (i.e. before you get to Washington Park). Proceed on through the housing development to the University’s property. The Commons will be the first facility on your left once you enter the University’s property. Come share our good news…good friends…and hear how GMA can work to keep Skagit special.